Background: The postoperative recurrence rate of chronic subdural hematomas (CSDHs) ranges from 9% to 20%, which is a serious concern for neurosurgeons. Both qualitative and quantitative assessment methods have been developed to identify the mechanisms involved in postoperative recurrence. These methods include Nakaguchi's clinical classification scheme and the quantification of mean hematoma density (MHD). This is the first study to examine the correlations between the quantification of MHD and Nakaguchi's clinical classification of patients with CSDHs. Materials and Methods: This study investigated 35 consecutive cases of CSDH between July 2010 and July 2013. In accordance with Nakaguchi's clinical classification, CSDH cases were separated into four groups: homogenous, laminar, separated, and trabecular. In addition, we quantified the area of the hematoma according to MHD using a computer-based image analysis of preoperative brain computed tomography scans. Results: The mean age of patients was 72.2 ± 8.05 years (range: 55–86). Mean MHD values were as follows: trabecular (12.45 ± 0.72 HU), homogenous (14.46 ± 4.51 HU), laminar (25.99 ± 0.93 HU), and separated (36.32 ± 3.04 HU). Differences in MHD were statistically significant for all CSDH types (P < 0.001, ANOVA with Student–Newman–Keuls post hoc test), and we observed a significant linear relationship between MHD and the priority order of clinical CSDH types determined according to postoperative recurrence (Spearman's rank correlation coefficient = 0.842, P < 0.001). Conclusions: This study provides statistical evidence that MHD is significantly correlated with Nakaguchi's clinical classification of CSDH. The applications of MHD quantification and hematoma's internal architecture helped to gain better understanding of possible mechanisms underlying CSDH recurrence. The procedures used to trace the margins of the hematoma on brain CT scans are outlined in [Figure 1] of a previous report. Briefly, the boundary of the hematoma was traced and defined using image analysis software (GE PACS Web System). The density of the traced hematoma was calculated and presented in Hounsfield units (HU) for each axial slice. The above-mentioned measurement of hematomas was shown in [Figure 1]. The 35 cases were classified as follows: trabecular (n = 7), homogenous (n = 13), laminar (n = 7), and separated (n = 8). Representative CT images of our patients for each category of Nakaguchi classification were shown in [Figure 2]. The mean MHD for each CSDH type was: trabecular (12.45 ± 0.72 HU), homogenous (14.46 ± 4.51 HU), laminar (25.99 ± 0.93 HU), and separated (36.32 ± 3.04 HU) [Table 1]. 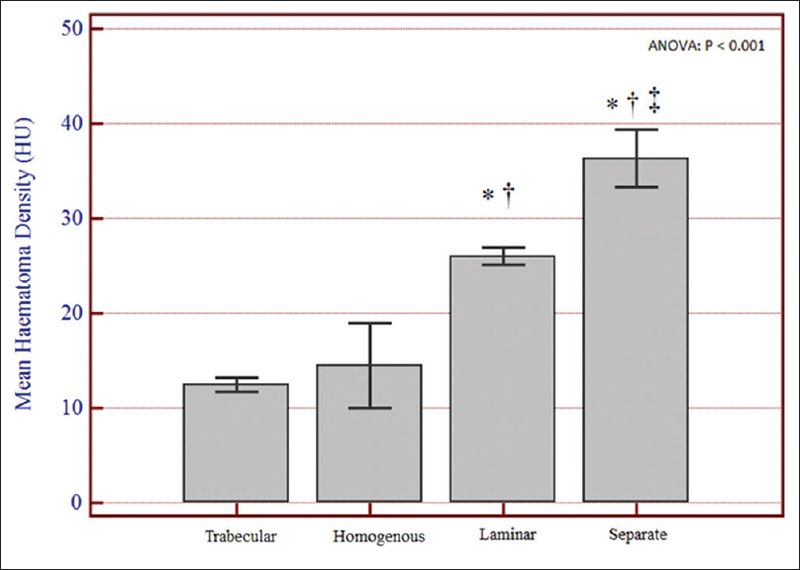 Differences in MHD were statistically significant between all types [Table 1] and [Figure 3], P < 0.001, ANOVA with SNK post hoc test]. We postulate that four types of CSDHs exerted different tendency for postoperative recurrence and their respective MHD quantitations were, therefore, distinguished. Since we previously observed higher MHD values in cases of postoperative recurrence, we sought to determine whether there is a correlation between MHD levels and priority order of postoperative recurrence rate in Nakaguchi's clinical four types. 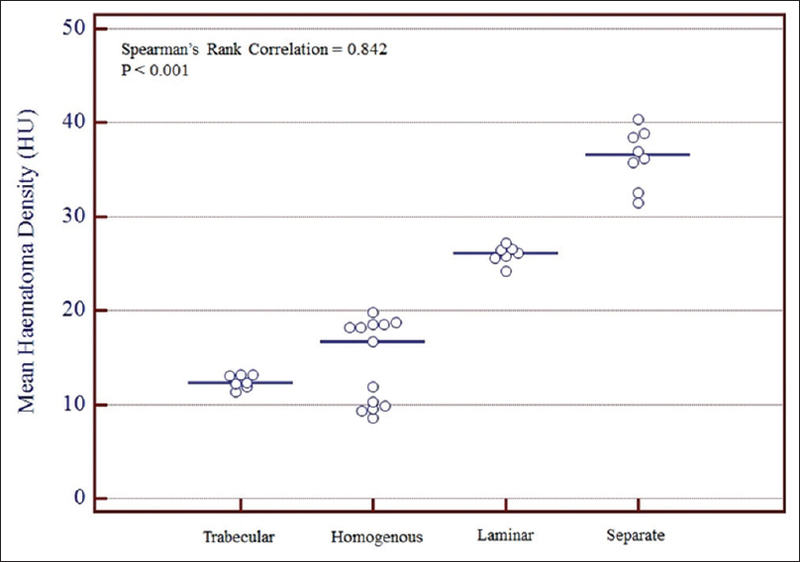 Spearman's rank correlation was assembled to examine the two variants (MHD and four clinical types). We sorted the ranked variable – clinical types – in ascending order of postoperative recurrence rate as follows: trabecular, homogenous, laminar, and separate. For each clinical type, we also ranked the measurement variable, MHD, in ascending order. A statistically significant correlation was observed between MHD values and the ranking of Nakaguchi's classifications determined according to postoperative recurrence [Spearman's rank correlation coefficient = 0.842, 95% confidence interval = 0.707–0.918; P < 0.001, [Figure 4]. In other words, clinical types that presented a higher risk of postoperative recurrence corresponded with higher MHD values. Sambasivan M. An overview of chronic subdural hematoma: Experience with 2300 cases. Surg Neurol 1997;47:418-22. Mellergård P, Wisten O. Operations and re-operations for chronic subdural haematomas during a 25-year period in a well defined population. Acta Neurochir (Wien) 1996;138:708-13. Ernestus RI, Beldzinski P, Lanfermann H, Klug N. Chronic subdural hematoma: Surgical treatment and outcome in 104 patients. Surg Neurol 1997;48:220-5. Lee KS, Doh JW, Bae HG, Yun IG. Relations among traumatic subdural lesions. J Korean Med Sci 1996;11:55-63. Kang HL, Shin HS, Kim TH. Clinical analysis of recurrent chronic subdural hematoma. J Korean Neurosurg Soc 2006;40:262-6. Frati A, Salvati M, Mainiero F, Ippoliti F, Rocchi G, Raco A, et al. Inflammation markers and risk factors for recurrence in 35 patients with a posttraumatic chronic subdural hematoma: A prospective study. J Neurosurg 2004;100:24-32. Park HR, Lee KS, Shim JJ, Yoon SM, Bae HG, Doh JW. 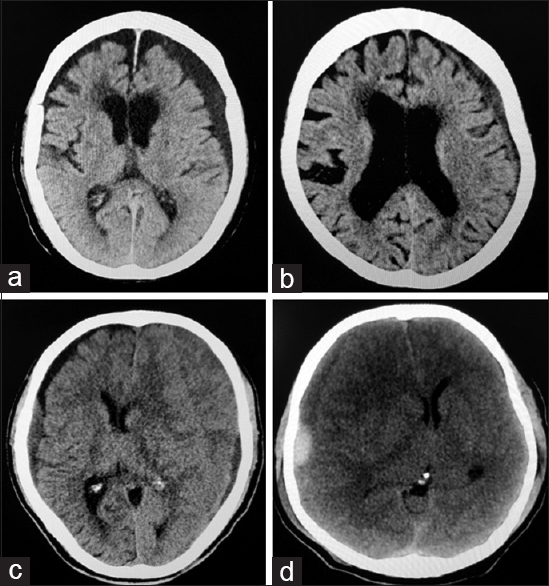 Multiple densities of the chronic subdural hematoma in CT scans. J Korean Neurosurg Soc 2013;54:38-41. García-Pallero MÁ, Pulido-Rivas P, Pascual-Garvi JM, Sola RG. Chronic subdural haematomas. The internal architecture of the haematoma as a predictor of recurrence. Rev Neurol 2014;59:294-300. Lin CC, Lu YM, Chen TH, Wang SP, Hsiao SH, Lin MS. Quantitative assessment of post-operative recurrence of chronic subdural haematoma using mean haematoma density. Brain Inj 2014;28:1082-6. 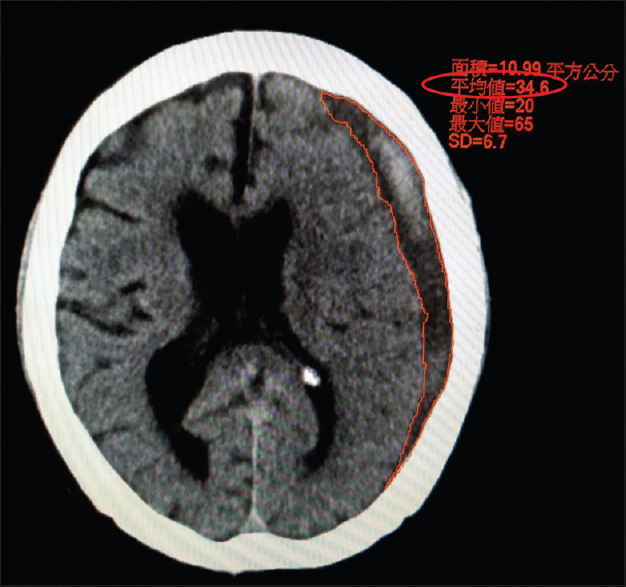 Kurokawa Y, Ishizaki E, Inaba K. Bilateral chronic subdural hematoma cases showing rapid and progressive aggravation. Surg Neurol 2005;64:444-9. Stroobandt G, Fransen P, Thauvoy C, Menard E. Pathogenetic factors in chronic subdural haematoma and causes of recurrence after drainage. Acta Neurochir (Wien) 1995;137:6-14.